What Are the Effects of Not Eating and Then Exercising? If you want to lose weight or get in shape, following a nutritious eating plan and a regular exercise program are the most effective ways to achieve your goals. Although it may be tempting to severely restrict your calories to help you lose weight faster, not eating can cause a variety of problems when you're exercising. Knowing the effects of not eating and then exercising can help you make healthy choices to keep your body fueled for your best performance. The effects of not eating before exercise depend on how much you're exercising and how much you eat normally. If you do not eat within an hour of a moderate workout, for instance, you will not feel any adverse effects if you eat a nutritious diet the rest of the day. If you do not eat for hours before an endurance event, you will be more likely to feel fatigued and you will need to replenish carbs after 60 to 90 minutes of exercise. If you do not eat enough in general, before exercising or at other times, you will suffer from some long-term effects, which may include nutrient deficiencies, fatigue, muscle cramps or irregular heartbeat. Most people can eat light snacks one to two hours before exercise and meals or heavy snacks three to four hours before exercise. If you do not eat for several hours before exercise, you will be more likely to feel fatigued during your workout. If you exercise for long periods or do high-intensity workouts, you will be more likely to suffer from low blood sugar and fatigue if you have not eaten for several hours. Your body uses carbohydrates as a main fuel source for workouts, and if you do not have enough carbs stored in your body from the foods you eat, your body may burn some fat. If your diet is severely restricted, however, your body will burn muscle tissue and even organ tissue to create energy, which can cause you to lose muscle mass, feel fatigued and develop long-term health problems. If you do not eat enough before exercising and do not replenish the carbs, fat and protein your body has used up during workouts, you are putting yourself at risk for nutrition deficiencies such as anemia. Anemia or low iron commonly causes fatigue and will make you feel weak during workouts. Iron deficiency leads to poor endurance during workouts, according to Bastyr Center for Natural Health. If you do not eat enough over an extended period of time -- such as months or years -- your body may go into starvation mode, burning body tissues for energy and holding onto any calories you consume to keep your basic systems running. Starvation mode makes it hard to lose weight and poses serious health risks such as bone loss, irregular heart rhythms and even heart attacks. 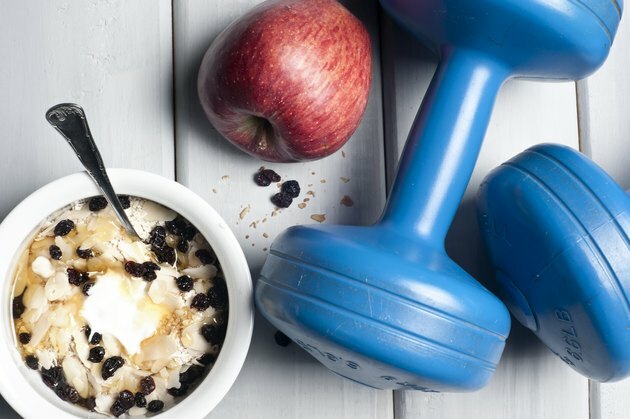 Keep your energy levels up and your body working smoothly during workouts by eating a nutritious diet with frequent snacks and four small meals throughout the day. Active people need plenty of carbohydrates, protein and healthy fats -- unsaturated fat -- for energy to perform well and stay healthy. The Institute of Medicine advises healthy adults to eat between 45 to 65 percent of daily calories from carbs, 20 to 35 percent from fat and 10 to 35 percent from protein. Why Am I So Tired After Exercising?